When considering a home improvement project, many wonder what financial gain the project will recoup and the percentage of return on their investment. It is difficult to calculate which projects give you the biggest bang for your buck. You may assume that the bigger the project, the larger the return…not necessarily! Luckily, you do not have to guess. For example, here in the New York/New Jersey area you could potentially see a 79.5% return on a mid-range kitchen remodel, a 61.6% return on an upscale kitchen remodel, and a 76.7% return on a mid-range bathroom remodel. Exterior renovations including window replacement, stone veneer, and entry door and garage door replacement can give you approximately a 100% and higher return. So how do they come up with these numbers? The data collected estimates the cost of twenty most common projects in 149 markets across the United States. The Real Estate industry weighs in with an approximation of how much the value of the home increases if sold within the first year following completion of a project. The cost versus value numbers are compared within the top 100 markets showing the highest survey results to determine the cost recouped for that market per project. The report is simple to read and gives a wealth of information. This is a MUST READ when considering a renovation project. 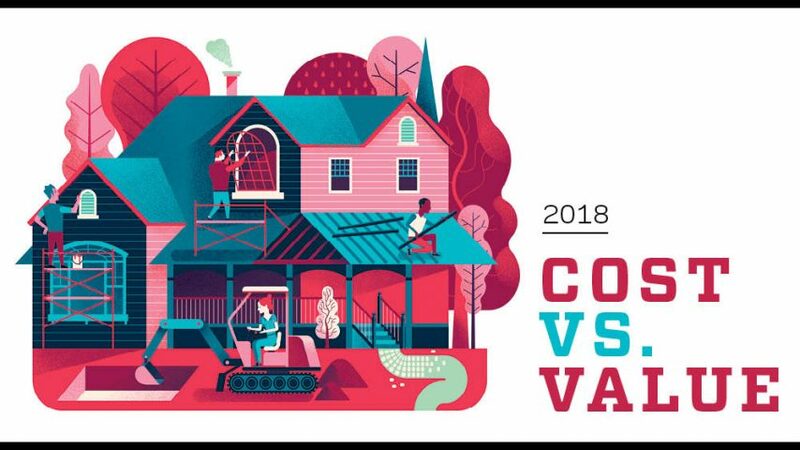 You can view the full 2018 Cost vs. Value Report at www.costvsvalue.com. All you have to do is enter your location, answer a few questions about your project, and you gain full access to the report at no charge. Access this year’s article through Remodeling Magazine’s digital edition here. We’d love to hear from you, let us know your thoughts and if we can guide you through your next remodeling project. You can fill out our client questionnaire here.